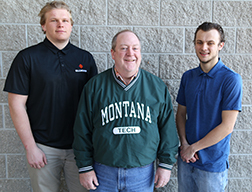 Montana Tech Metallurgical and Materials Engineering students, Nathan Burrington, from Spokane, WA, and Ethan Blevins, from Ronan, MT, have received internships and scholarships from ELLWOOD. “I am excited for the scholarship and opportunity presented to me by ELLWOOD,” said Burrington. “Ellwood's employee-first culture of safety, hard-work, and communication is one of the many reasons I am excited to work with them. I appreciate the education I received in Metallurgical & Materials Engineering at Montana Tech as it prepared me to receive this scholarship without prior steel work experience. I feel lucky to have the opportunity to work and learn under ELLWOOD’s excellent staff for the upcoming summer. Blevins added, “Montana Tech is a great school that offers its students amazing opportunities. I am very grateful for the chance to represent Montana Tech and its Metallurgical & Materials Engineering Department while at ELLWOOD this summer. ELLWOOD is a great company focused on long-term growth through its employees. I am looking forward to the hands-on learning I will undertake this summer." Both Burrington and Blevins will intern for ELLWOOD in the summer of 2019. Ethan will intern at ELLWOOD Quality Steels in New Castle, PA and Nathan will intern at ELLWOOD City Forge in Ellwood City, PA. Both will have the opportunity to interact with metallurgists and engineers, as well as to gain experience in important fields such as forging and heat treating. After successful completion of their internship, they will each receive a $5,000 scholarship.